Gor Mahia won their first major build up match of 2018 when they dispatched Ugandan champions KCCA 4-2 at Afraha stadium on Saturday. The win bodes well for Kogalo considering that last year around the same time, they fell to Onduparaka of Uganda 2-0. Gor Mahia also lost to KCCA at the 2014 CECAFA club cup. Gor Mahia coach Dylan Kerr on Saturday started Ivorian import Ephraim Guikhan on the bench but it eventually didn’t matter, as his charges thrashed Ugandan champions Kampala City Capital Authority (KCCA) 4-2 in a high profile friendly match at the Afraha Stadium in Nakuru. K’Ogalo’s new signing Humphrey Mieno nodded home the opening goal of this pre-season encounter at the half hour mark. The lanky midfielder reacted quickest to meet a free-kick from international Francis Kahata to beat the advancing Thomas Ikara who was guarding the visitors’ goal. Mike Mutebi’s KCCA would eventually pay for that miss, as Boniface Omondi added a second for the hosts with four minutes to the break. 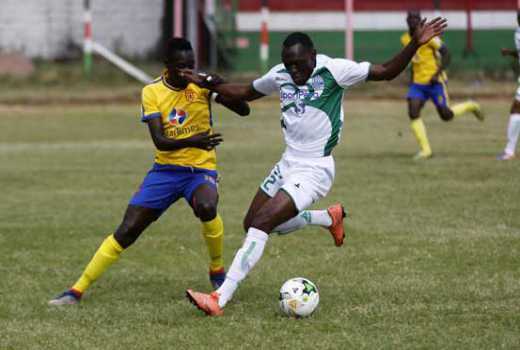 This game was over as a contest moments after resumption when Kenya international George “Blackberry” Odhiambo scored his first and Gor Mahia’s third goal, even though Julius Poloto pulled one back shortly after. The two teams exchanged a goal in the final minutes of the game with Odhiambo getting his brace. Innocent Aniku was the scorer for the Ugandan side. “Our performance was satisfying considering Gor Mahia are an experienced team. We are now targeting the group stages. We have the right players this time and we have tested their confidence since most of them are young,” Mutebi said after the game. “We got the goals well although we had lost five chances earlier. I am happy with the two goals our opponents got but the win is good for our confidence,” said Gor coach Kerr. The two clubs were using this contest as part of their preparations for their forthcoming African Champions League assignments. KCCA are set to meet Malagasy side CNaPS in the preliminaries of the Caf Africa Champions League while Kenyan champions Gor will face Equatorial Guinea side Vegetarinos. The first leg matches are scheduled for February 8 to 10. KCCA will now proceed to Nairobi to play Tusker and AFC Leopards in Ruaraka and Machakos on Monday and Wednesday respectively. Gor, who thumped Egerton University 6-0 in their opening pre-season game, will proceed to Machakos for another pre-season friendly against Sudanese giants Al Hilal. 4-3-3… it appears Kerr is seriously exploring the 4-3-3 model which potentially could be a game changer this season but in as much is it is very attacking oriented and utilises the midfielders fully, it could also mean alot of our strikers warming the bench ( expect Jausenge to be utilised as the sole central striker with berry and Kagere plying on the wings ) . This i think he may resort to this model when we are short on strikers and wingers or when we are defending away from home such as big matches like esperance. 4-2 -2 -2 ..Should be explored as we have huge reserve of players who can be deployed both as wingers, main strikers, second strikers and attacking midfielders ( berry, juma, cassidy, kahata, samuel onyango , kevin omondi, bernard omondi, guikan and even innocent wafula ) . would love to see Kerr give this a try in our next friendly match. 4-2-3-1..Huge potential if Kahata and Mieno must play for 90 minutes and i think Kerr should try this option in training as firing kahata and Mieno on a good day can be a headache to every defender. I think this is a good start as compared to the previous years where they have been losing their pre_season friendlies, but what i can advice kerr to do is to look for apertern that will best fit all our strikers (Guikan, Samuel Onyango, Kagere, Jausenge, end Berry) they cant be fielded at atime, others must warm the bench so it will be acompetion, then 4-3-3 formation i dont think if it can work because even zemaria tryied it during his stay but it dint work best playing with three strikers sometimes is aproblem, but otherwse lets wait and see. I think every one has an obligation according to the position one holds and every opinion is important buh the coaches know ….its the pre season when one tries new combos for the new season..we need almost 4 ways to approach a game….and that is a master plan when u have a backup for a backup plan… my thinking is let the coach try as many of the formation as he want and if possible apply as many of them……. and we as fans go sych the team up and hope that the coach and the team performs….jasego what’s the status on sportpesa or have we got anything else?! i am happy with this new kit. It is the best that I have seen in many seasons.